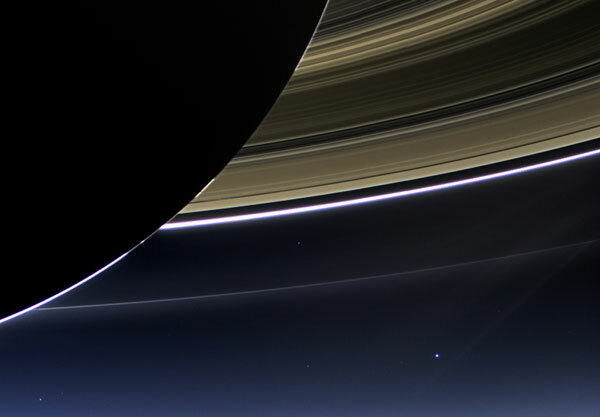 For an interesting perspective on the solar system, take a look at this image of Saturn, its rings, and Earth, which is the blue dot near the bottom right (indicated by the arrow). 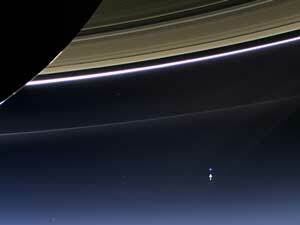 NASA claims that the moon can be seen sticking out on the right of this tiny blue dot slightly to the right of center (compare with the image in this earlier Physics to Go feature). To learn more, visit this NASA news item. The particles that make up Saturn's rings are in orbit around the planet, in the same way that the planets orbit the sun. Even particles as small as dust move in this kind of orbit. See this additional NASA news item for evidence of dust orbiting the sun in Earth's "tail." 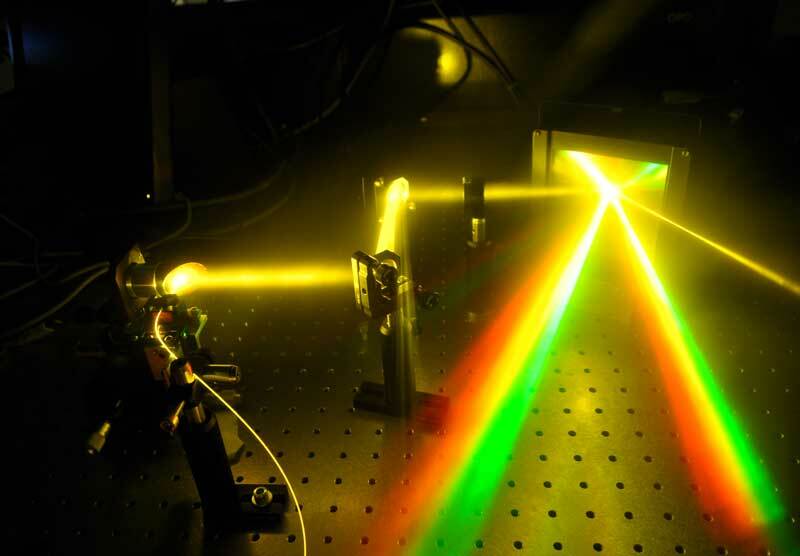 The photo above shows a "supercontinuum" laser, which produces laser light in much of the visible spectrum (red, orange, yellow, green, blue, indigo, violet). In this photo, the laser light hits a diffraction grating, which acts like a prism and reveals the individual colors of the light. Look how bright the light of each color is! An ordinary laser produces laser light with just one frequency (that is, light of just one color). In a supercontinuum laser, infrared laser light passes through a special glass fiber. In the fiber, this light generates many new frequencies (new colors) in the visible spectrum, and can produce white light. To learn more, see Wikipedia: Supercontinuum. For a photograph of another supercontinuum laser, click here. Note how in this photo, the coil of fiber produces all the colors of the spectrum. Also, can you find the fiber in the image above? The image above is an x-ray of a fruit fly, made with x-rays produced by a particle accelerator. 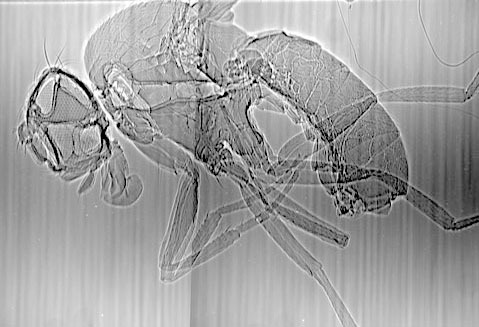 As you can tell from the parts of the image where the legs overlap the body, you are able to see right through the fly. X-rays are one kind of electromagnetic waves. The image above was made with "coherent" x-rays, which means that all the waves were in step, just like the radiation from a laser. 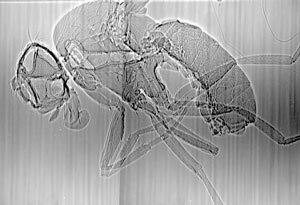 For an x-ray image of a beetle, showing the breathing tubes inside its body, visit this article. Living insects can be imaged in this way. To see inside a living beetle, see this University Of Chicago article. Notice the pair of images, which show the beetle airways contracted and expanded. These two images prove that the insect is breathing. 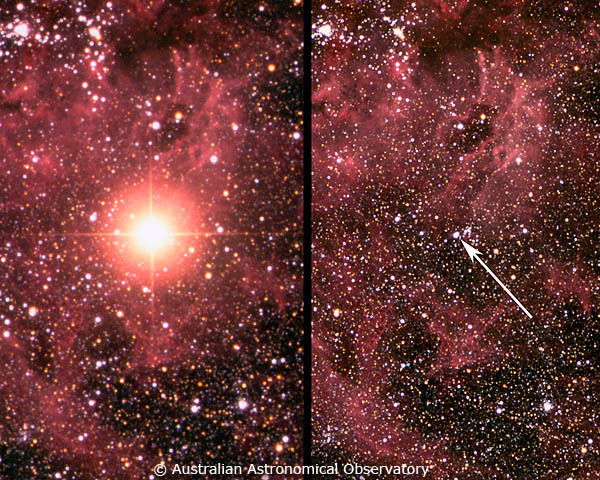 Here is a before-and-after view of a part of the sky where a supernova appeared in 1987. A supernova is a catastrophic explosion in a large star. Two hours before this supernova was seen through telescopes, it was announced by a spike in the count of neutrinos in several detectors on Earth. The arrow points to the star before it exploded. Neutrinos are tiny, uncharged, nearly-massless particles that travel at almost the speed of light. A supernova produces a vast number of neutrinos; in fact, most of the energy of a supernova is given off in neutrinos. To learn more about neutrinos, see Physics at Home and Worth a Look just below. 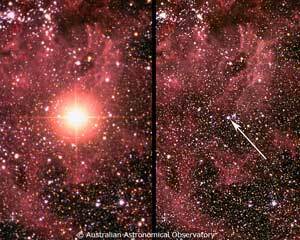 To learn about Supernova 1987a, visit Hyperphysics and Physics Central, and for much more detail see AAVSO. 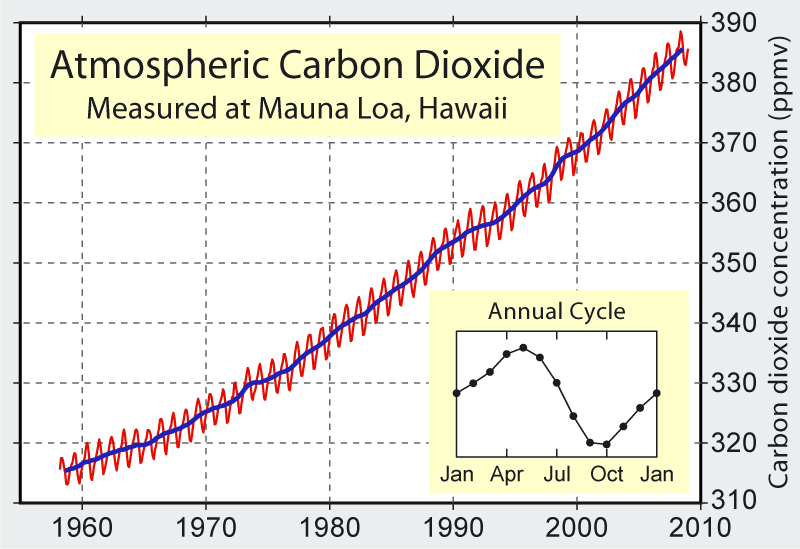 This is the famous "Keeling curve" of carbon dioxide concentration in the atmosphere versus time, from about 1958 to about 2007, measured in Hawaii. Notice that the rate of warming (indicated by the slope of the blue line) increases slowly but steadily over time. Carbon dioxide is an important greenhouse gas. Greenhouse gases absorb the infrared radiation given off by Earth. This absorbed radiation is promptly re-emitted in all directions; much of it returns to Earth, raising the temperature of its surface by a substantial 33°C. The inset in the graph shows the annual cycle: For six months, plant photosynthesis absorbs carbon dioxide from the atmosphere, and the curve goes down; then, for the next six months, the decay of dead plants returns carbon dioxide to the atmosphere, and the curve goes up. To learn more, visit Greenhouse Effect and also this UCAR page. This image of a solar prominence was captured in extreme ultraviolet light on December 31, 2012. The prominence is ionized gas--charged particles, with electrons stripped from atoms, which move due to forces from magnetic fields. 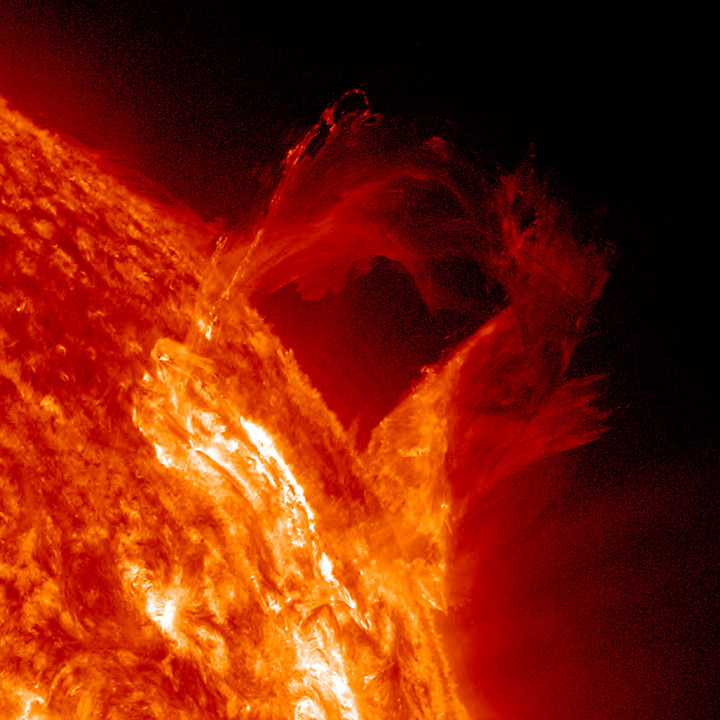 To learn more about solar prominences, visit Solar Flares--Solar Prominences. To see a different solar prominence, with an image of Earth added to show the scale, click here. image credit: Xiaodong Chen and Vigor Yang (School of Aerospace Engineering, Georgia Institute of Technology, Atlanta, GA); image source; larger image. This image is a high-resolution computer simulation of the head-on collision of two tiny drops, one moving up and one moving down. The drops approach each other with a high velocity, so there is considerable energy in the collision. For more information, see this description. 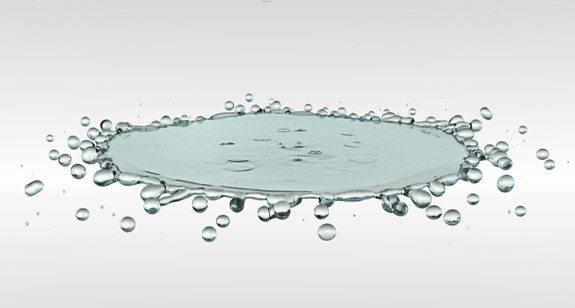 The diameter of each drop is only about twice the thickness of human hair. Imagine how hard it would be to do this experiment and see what actually happens. Also, compare the image at left with the simulation above: Note how the edge of the disk and film break up into drops in a similar way. You are looking at a composite: The image of the southern lights (Aurora Australis) is superimposed on a "Blue Marble" image of Earth; both images were captured by satellite. 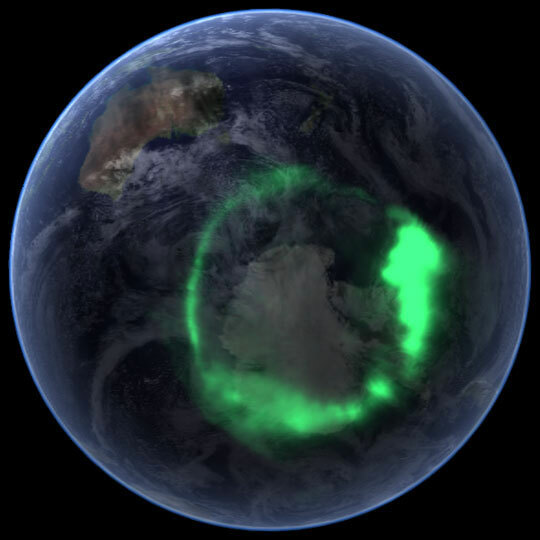 Click on NASA's IMAGE Satellite View of Aurora Australis from Space to see a video of this aurora. Notice that the Aurora occurs at about the same latitude. That's because the Aurora's green light is produced by charged particles from the sun, which collide with oxygen atoms in the atmosphere. These charged particles follow Earth's magnetic field lines. Where these lines come close together, near the two poles (like the field lines of a bar magnet), the Aurora can occur. For more on this process see Astronomy Notes. 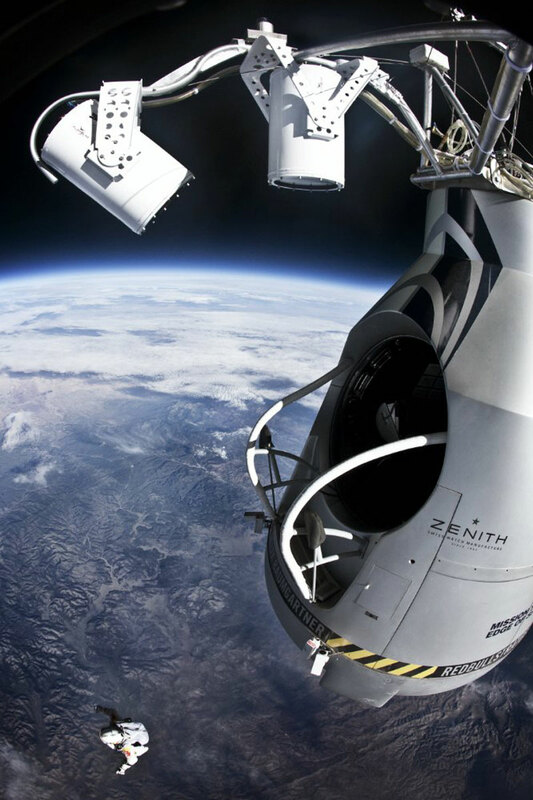 The figure at the bottom of the photo is Felix Baumgartner, shortly after he jumped from an altitude of 39 kilometers (24 miles). There, the thin atmosphere produces very little air resistance, so he was almost in free fall (in free fall, the only force acting on an object is gravity). He accelerated rapidly, broke the sound barrier, and went on to about Mach 1.2 (20% above the speed of sound). For more detail, visit this Mission webpage. To learn more about the Stratos project, see Mission to the Edge of Space. 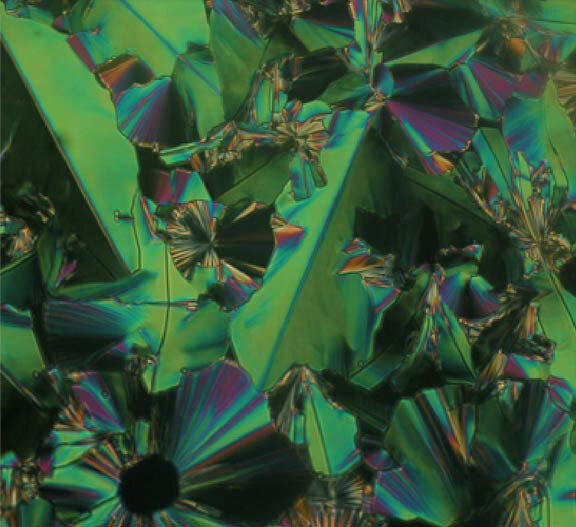 Here is an image of a "bent-core liquid crystal"-- to learn more about these substances, visit Physics Images: Bent-Core Liquid Crystals.